SWMinis has a pending update that should be live by the end of the week of February 18th. 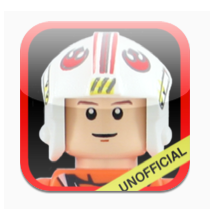 Although it contains 27 new minifigs, the real highlight is the new grid layout, as well as many other new features. - Creatures are here now! Also added for the first time are Creatures! 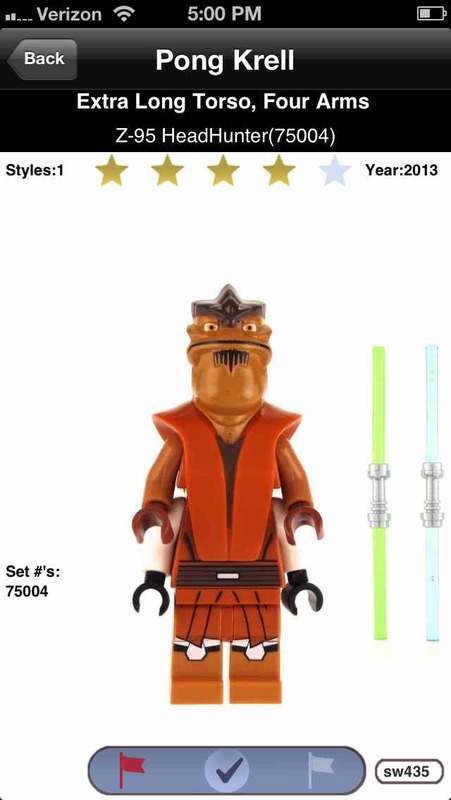 There are 13 added inluding the new Rancor, Wampa, and even Jabba's frog. Many of you requested this. You can now view your entire collection on one screen. This was the most requested feature. 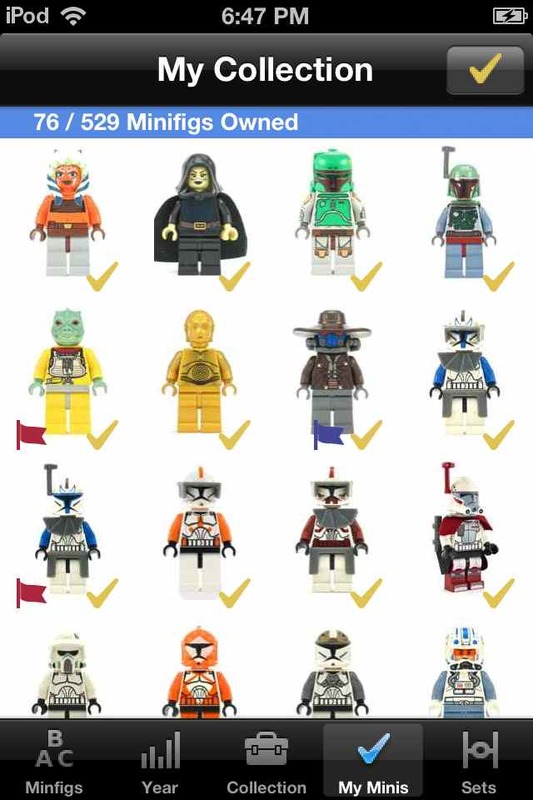 These figures are all checked because you own all of them, hence the 'My Collection' screen. Notice a few have a red or blue flag. More about that in a sec. You get two flags, a red and a blue one and these are always shown by a figure. In addition, you can filter by the flags on the own screen and show the flagged figures instead of the ones you one. Click the Check icon in the upper right to toggle to the red flagged figures, then the blue flagged figures. If folks need another flag I have room to add two more in the future if this system works, so please tell me your use case and justify why you want more (green or black). Lightsaber hilt colors are also now corrected. I went back and looked at all the sets a figure came in and looked at most recent set inventory for a fig to determine whether the hilt was chrome, metallic, or gray. All lighsaber variants were rephotographed for consistent appearance and mapped to the correct figures. Interestingly a few later sets still used the chrome hilts after they were discontinued. I can't remember off hand but I think they were signature sets such as the Imperial Shuttle that had the printed Stormtrooper pants and the Death Star. 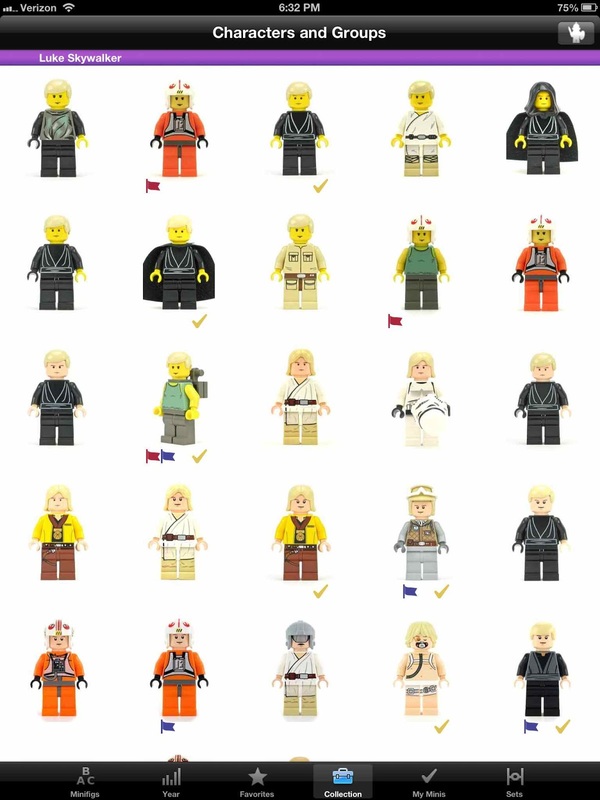 Also Palpatine from the Death Star appears in multiple sets. 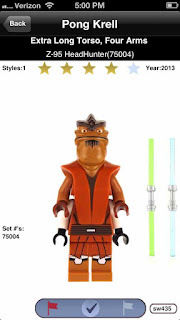 His weapon in the Death Star from the instructions is blue lightning bolts, but in the other set he has a red lightsaber. I gave him the lightsaber in the app since I figured that was the better weapon. 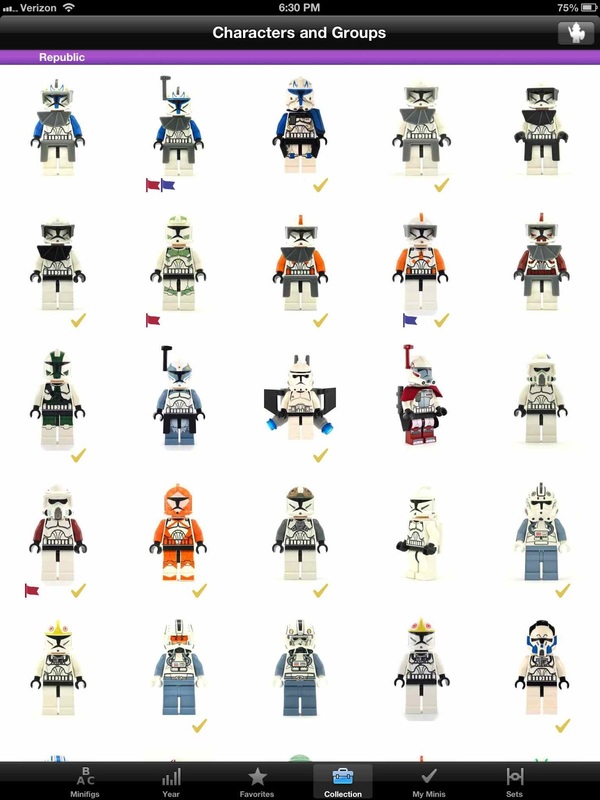 Clone Trooper naming is all over the map both from the set names and what is on Bricklink. 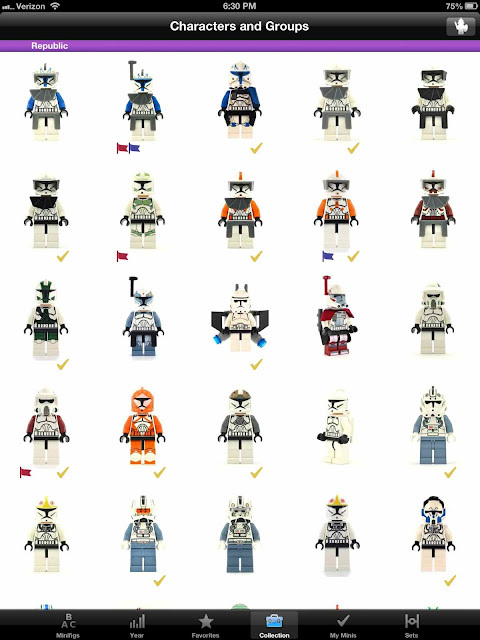 I decided that it was important for you to see all the Clone troopers listed after one another alphabetically, so now the all start with the word Clone. See the app, I think it works better this way and no information is lost in translation. Rank, Legion, and name (if mentioned) are all there. Finally, the code was rewritten and moved to iOS6 coding conventions and best practices. Also the minimum OS is now also iOS6 because the grid layout, a key feature, only works in iOS6. From tracking websites now 85% of devices have upgraded to iOS6, so apparently the only ones that haven't are the ones that can't. Unfortunately this burns a few of you, particularly those with iPad v1 or iPod v1 or v2. The grid view stresses even the most recent iPad a bit, so I can see why Apple chose not to support it with older devices. It is such a killer feature, and fulfilled so well the largest user request (all figures in my collection on one screen) that I had to move to iOS6.